Last year, Coachella's main event art installation was a giant snail. 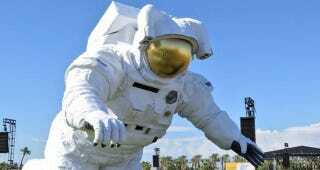 But this year, the mobile art installation at the popular music festival is a three-story-tall astronaut, formally known as "Escape Velocity." And it's totally awesome. The construction of this floating astronaut alone is impressive—it's more Macy's Thanksgiving Day Parade float than stationary statue, although the Macy's floats are inflatables. The Astronaut, on the other hand, is far more sturdy and comes with moving parts. The bottom is a 12k variable-reach forklift, and the body is made up of chicken wire, steel tubing, and pin-rods. Animatronics let its hands wave, saying hello to the crowd. It moves slowly and gracefully, as if actually navigating through outer space. What's more, this isn't even the only installation at Coachella. This year, for example, there are giant, colorful, morphing funhouse mirrors, big wooden domes with walls made of plants, a humongous red robot, and a pink and purple light-up pretzel-like twist. In fact, the Indio, California festival has about a $2.2 million dollar budget for public art. It's one of the biggest budgets for large-scale art at any festival or event anywhere, for that matter, as Hanson told Co.Design. Sure, you can kvetch about those $400 passes and $9 beers Coachella peddles to actually underwrite that, but the scale is impressive regardless.